The use of overhead rail shot blasting units is recommended for the treatment of sensitive parts which cannot be tumbled in bulk loads and for particularly complex, heavy, or large parts. 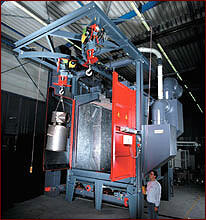 The parts are hook mounted and transported into the blasting chamber. The simultaneous rotating and oscillating movement of the hooks ensure that the blasting media, accelerated by the multiple blast wheels, reaches every component providing the best possible uniform blasting result. Rösler Overhead Rail units are very versatile units, and thanks to their compact design, require minimum floor space. The use of Rösler overhead rail shot blasting units is recommended for the treatment of sensitive parts which cannot be tumbled in bulk loads and for particularly complex, heavy, or large parts. Besides the monorail-system there are also the Y track and a power and free continuous system options.